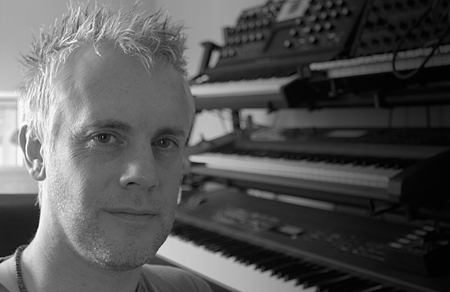 Kevin has been playing music since the age of eight and has since produced music for theatres and production companies including BBC Television. His music has been used around the world in various broadcast applications and the Eventide Music series of albums have been featured on BBC Radio in the UK. Those interested in a more in-depth biography should read the interview with Serge Kozlovsky, in which Kevin tells of his childhood memories and musical influences, amongst other fascinating details. He has long been aware of the power of music in influencing moods and creating atmospheres and of its relaxing properties. In 1992, he began producing albums of his music to enable others to enjoy its magical sound. Kevin's distinctive musical style has evolved from a feeling that much of the so-called "New Age" Music around offers little to interest the listener, and comes across as bland and unadventurous. By contrast, he has produced this range of top-quality albums that can be enjoyed through active listening or as background music. As a qualified pilot, Kevin finds further inspiration for his music by flying above the landscapes that inspire him, and soaring amongst breathtaking cloudscapes. All albums are available now from Eventide Music - visit the Album Library now for more detail on each of Kevin's superb titles.